How far will your guests walk? We all walk miles at trade shows, but how far? This healthy pedometer promotion calculates distance walked and combines it with a healthy and fun contest. Booth Traffic - Drive foot traffic to your booth. To qualify to compete, event guests are required to register at Race Headquarters, conveniently located in your booth. At Race Headquarters, a leader board prominently announces the host partner and keeps track of the walking leaders. Contestants check the leader board throughout the day to gauge their standing. Daily and grand prizes are awarded. You select the prizes, branded pedometers included. Make It Social - 3D will provide a mobile website for contest promotion, sponsors advertising, push messages and reporting pedometer scores. Our mobile website scoring and messaging creates multiple advertiser-attendee “touch points” during the event. 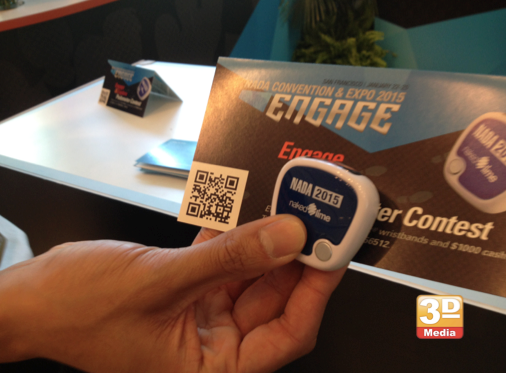 Attendees are invited to submit their daily pedometer scores using their mobile phones. Registered contestants will be sent a reminder text to submit their daily pedometer progress at days end. Guest Data Capture – When guests register to compete, attendees are required to complete sales survey questions. Your sponsor creates the questions, we report them. Brand Immersion – Immerse your clients in your brand. Each prospect spends 15 minutes at this promotion. Your brand, your banner, scripted brand ambassadors and this engaging experience will envelope your clients. Your message will be heard and remembered. This Promotion Includes - Branded pedometers, pre-event registration micro website, mobile website, sales survey collection, brand ambassador, one leaderboard and contest management.